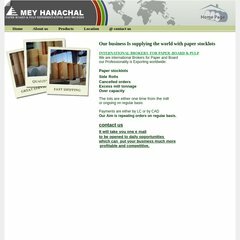 a-nahal.com Paper stocklots traders-corrugated paper exporters- paper joblots ..
19 users visit the site each day, each viewing 5.00 pages. It is hosted by Bezeqint-hosting, using Microsoft-IIS/6 web server. Its 3 nameservers are ns2.bezeqint.net, ns3.bezeqint.net, and ns1.bezeqint.net. The site is programmed for PleskWin.